Cyrene Island Hotel ( ex. Aurora Cyrene ) is in the south of the Sinai peninsula, close to Aqaba Gulf. The area is popular and famous for its exotic marine life and coral reefs. 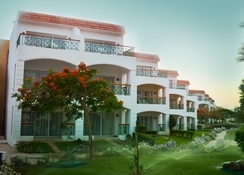 The hotel has a good selection of beaches nearby including Ras Nusrani Bay. The reefs just offshore are considered to be among the top five diving and snorkelling sites in the world. 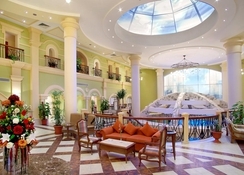 The Crystal Sharm is in the Montazah area of Sharm and has views of the Tiran Islands. It is popular with families and has a watersport activity centre for children and teenagers. 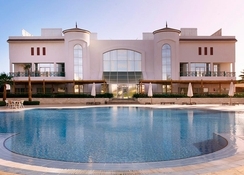 The resort has big named hotels, restaurants from around the world, water sports and golf course. Please note that a visitors visa may be required if you travel outside the Sinai desert and if you go diving or sightseeing outside Sharm El Sheikh. The visa will cost 10 GBP. The hotel has a buffet style restaurant and a pool restaurant. 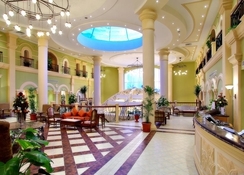 The hotel also has a cafe, piano bar and pool bar. The hotel has an All Inclusive option which includes breakfast from 7am to 10am, lunch between 1pm and 3pm and dinner between 7pm and 10.30pm with theme nights, all buffet style, served in the main restaurant Fayrouz. During breakfast beverages from dispensers mineral water, juices, tea, American coffee and hot chocolate are offered; during lunch and dinner, all the above plus soft drinks from dispensers, local draught beer and wine (by the glass). Light late breakfast takes place in Sinai lounge from 10am to midday. Snacks (two items of food) along with self-service beverages from dispensers are available at the Tiran pool restaurant between 4pm and 5pm. Tea time with dry tart and English cake is from 5pm and 6pm at the Sinai lounge. Kids have a special corner in the main restaurant for lunch and dinner. They can also have ice cream, cakes and juices from 4pm and 5pm at the kids club. 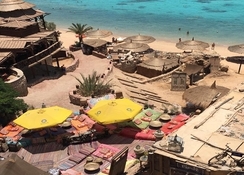 Locally produced alcoholic and non-alcoholic drinks like soft drinks, mineral water, tea, coffee, juices, draught beer, cocktails, gin, vodka, rum, brandy and whiskey are served at the beach bar between 10am and sunset, the Sinai lounge bar between 10am and midnight and the Rosetta pool bar from 10am to sunset. Guests can have self service beverages from dispensers at the Badia Beduin tent from 7pm to midnight, plus oriental hot drinks and the Amphitheatre bar plus beer by the glass during show time. On arrival day there will be one small bottle of mineral water per person in the room. 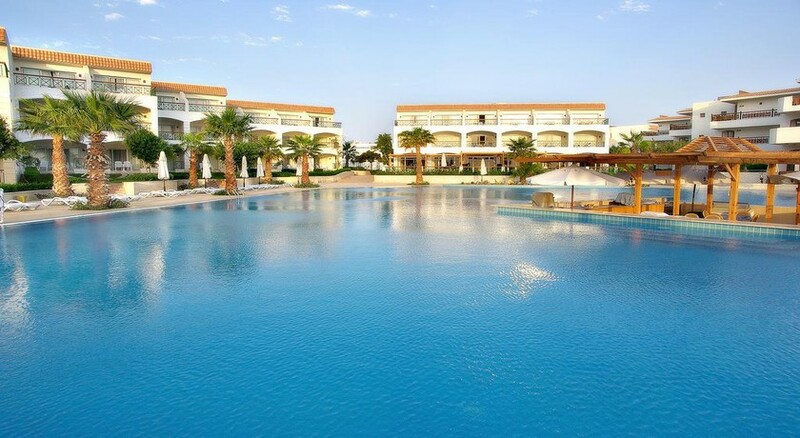 This hotel will appeal to families and couples looking for a good standard of accommodation from which to enjoy a relaxing or active beach based holiday in Egypt.